The San Antonio missions have been the subject of historical and archeological research for decades. At left, a reconstructed scene of Mission San Jose by artist Ernst Schuchard helps bring the color and cultures of the Spanish mission to life. 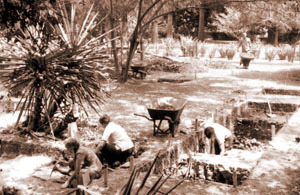 Top right, archeologists from the Center for Archaeological Research at UTSA conduct excavations at the San Jose grist mill under the watchful eye of visitors. Bottom right, an array of artifacts recovered from mission sites, including a crucifix, chipped-stone arrow points made by mission Indians, and fragments of an early blue and white majolica bowl. Detail of painting by Ernst Schuchard, courtesy of the Daughters of Republic of Texas Library. See full painting. Photos courtesy of Center for Archaeological Research, University of Texas at San Antonio. San Antonio is an area rich in Spanish Colonial history. It’s mild climate and resources—clear springs and streams, fertile soil, and diverse game animals—were a powerful attractant to the Spaniards much as it pulled native peoples to the area for thousands of years before. The city had its beginnings in 1718, with the establishment of a complex of governmental and religious institutions: the royal presidio of San Antonio de Bexar, the municipal government of San Antonio de Valero, and Mission San Antonio de Valero. The mission, later to be known as the Alamo, had been moved from an earlier location on the Rio Grande near the town of Guerrero, Mexico, part of the Gateway complex. In 1720, a second mission, San Jose y San Miguel de Aguayo, was established downstream on the San Antonio River. A decade later, three missions which had unsuccessful beginnings in East Texas were relocated to San Antonio. 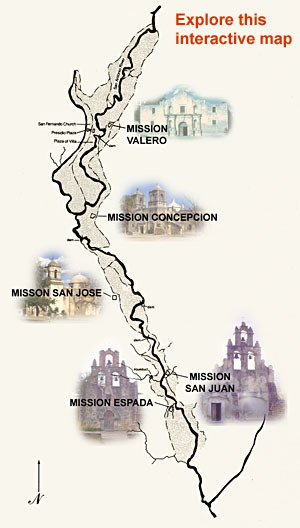 Situated at key points along the river, they became known as Missions Concepcion, Espada, and San Juan Capistrano. Here Franciscan friars congregated groups of native peoples in hopes of converting them to Christianity and the ways of Spanish citizenship. The priests faced numerous difficulties, including trying to communicate with diverse groups of neophytes who spoke such languages as Coahuilteco, Aranama, Cotonama, Karankawa, Caddo, and others now unknown. Drawn from many different bands from across south Texas and beyond, the native families entered the missions with different lifeways, traditions, and names, signs of an “uncivilized” past which the Spanish swiftly set about to change. Along with training in Christianity and Spanish civil government, the native charges were taught trades and crafts such as farming, ranching, masonry, weaving, and blacksmithing, all of which helped sustain the mission enterprises. Although they periodically left the missions to hunt and gather wild animals and plants and joined with other groups for trade and seasonal events, the San Antonio neophytes did not resist conversion as strongly as others in missions on the Gulf Coast and southeastern part of the state. Many were glad to have the protection of the mission compounds as attacks from hostile Plains tribes, such as the Lipan Apache, increased throughout the region. European-borne diseases, however, took a heavy toll on the native mission occupants, and populations continued to decline in spite of efforts by the Spanish to recruit additional charges. In the closing years of the 18th-century, Spain’s military and economic interests in northern frontier waned, and support for the missions was withdrawn. In San Antonio, all five missions were secularized by the turn of the century. The remaining native converts assimilated with nearby local populations or migrated to Mexico. Today, residents of the San Juan/Berg’s Mill community and others have begun to attempt to trace their heritage through Spanish Colonial mission records and oral histories, including traditions handed down from generation to generation (see Native Peoples of the South Texas Plains to learn more about the diverse groups that were drawn into Texas missions). Archeological investigations at the missions over the last 75 years have uncovered a wealth of evidence pertaining to mission life. Excavations have helped to trace original locations of buildings, walls and other architectural features and point up changes in use through time. Much has been learned about the lifeways of the missions’ native residents through investigations in the Indian quarters and in trash middens outside the compounds. Texas Beyond History hopes to have the opportunity in the future to bring the results of this research online as well as shine more light on the rich cultural heritage of San Antonio. The National Park Service website for the missions and mission trail provides brief historical background as well as helpful visitor information including a calendat of upcoming events. The official Alamo website by the Daughters of the Republic of Texas (the DRT have served as custodians of the historic site since 1905). This repository of Texas treasures, including paintings, documents, and photographs, is operated by the Daughters of the Republic of Texas. The Legacy Program at the Center for Archaeological Research, UTSA, conducts tours through their laboratory where many of the collections from San Antonio mission archeological excavations are curated. 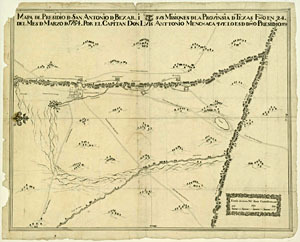 Map of San Antonio missions and presidio in 1764 (orientation is easy-west, with San Antonio River at top and Medina River on right). Shown also are the Caminos Reales (Royal Roads) and crossings on the Medina River just southwest of San Antonio. Spanish explorers and missionaries traveled on this important transportation and commerce corridor stretching from San Antonio to points along the Rio Grande River. Mapa del Presidio de San Antonio de Bexar, courtesy John Carter Brown Library, Brown University. Missions San Jose and Espada. Research and excavations have been conducted at the Alamo over several decades. Photo courtesy of the Center for Archaeological Research, University of Texas at San Antonio. 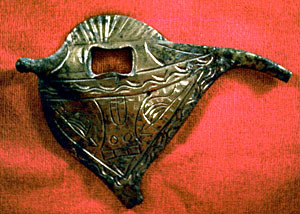 Sword guard from Mission San Juan. Photo courtesy of CAR-UTSA.